I bought these short boots 20 years ago. I know this because the receipt is still in the box. 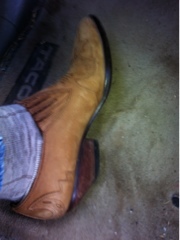 I wore a size smaller jeans 20 years ago, but can still wear these boots comfortably. We attended a chili cook off last night. Our contribution was a pot of Homer's chili, a recipe developed when he worked at Westinghouse and every person in his workgroup would contribute one item to the pot and then consume the contents (along with a loaf of bread) for lunch. Fundamentally it is the same recipe: now the beef is our own grass fed, the tomatoes are ones we grew and canned last summer, and some of the heat and herbs we grow. Each chili preparer selected a charity to benefit voted the winner. We selected a program that helps veterans become farmers, a program we think is a great idea. The winner was the hosts chili, and their charity, the symphony orchestra trains kids and provides instruments to teach music: a wonderful program. We had a great time, visiting old friends, meeting some new, great food. And the boots? What do they have to do with this? Multiple compliments. 20 years later. I've worn them with skinny jeans, big bells, boot cuts and now skinny jeans again. A good pair of boots will last a gal a lifetime if not actually worn on the farm.